Away from the more sensational headlines, good news emerges. In recent years, the media has devoted a lot of time and space to how robots and machines are taking on more and more human jobs. The stories often give rise to fear and a negative sense of what artificial intelligence and machine learning could potentially do. 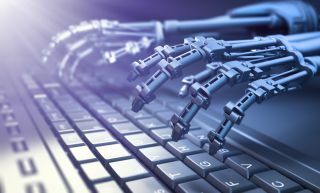 However, away from the more sensational headlines, good news emerges of how machines can help humans make businesses more efficient, transparent and cost effective. One of the more positive stories of human/machine collaboration concerns SMEs and government contracts. It’s no surprise to hear that SMEs are the engine of any country’s economy. In addition, the World Bank states that the 600 million jobs which need to be created to absorb a growing global workforce will have to come from SMEs. However, SMEs often build their business development and sales activities around B2C and B2B plans. Adopting a B2G (business to government) sales plan very seldom features in a SME’s growth strategy. In fact, as few as 10 per cent of SMEs compete for government tenders. Yet government tenders in Britain are worth £200 billion per annum, and, globally, tenders account for $3.2 trillion dollars. Most SMEs are not competing for tenders and as a result are doing themselves out of the most lucrative revenue pipeline in the world. This in turn impacts on their own longevity and ability to create more jobs. It’s easy to understand why most SMEs don’t compete for government contracts. There are questions over the complexity of tender requirements, a niggling doubt that tenders are rigged and the same winners succeed all the time – as well as a general belief that there just aren’t any tenders out there for specific SMEs to win. This is where machine learning comes in and changes the tender playing field significantly for SMEs, according to Tony Corrigan. Founder and CEO of TenderScout, Tony was disheartened to realise how many excellent SMEs were missing out on winning government contracts and knew that machine learning could help. “I graduated as a software programmer but quickly moved into a position in a sales team for IBM at the start of my career, and learnt from the best how government tenders are won. Once I understood the ropes, it was a fairly straightforward process to write winning tender proposals as I had a team around me and all the resources that you’d expect from a large corporate,” he explained. Soon Tony was to get a taste of the other side of the coin. “Once I left IBM and started working as a bid consultant helping SMEs win tenders, I realised that the government procurement process is incredibly intimidating for most SMEs. I also knew that if SMEs had some competitive intelligence at hand they would win some of the tenders that governments award to corporates, purely because corporates are often the only ones competing,” he added. The insights to be gathered from the data generated by past tender competitions are worth their weight in gold for new businesses who want to engage with public contracts. However, there is so much data that no human has a reasonable chance of being able to assimilate all of it to pick out the insights that will help them create a winning proposal. The result is that most SMEs who compete for tenders do so in an ad hoc manner - and lose. “The only reason why corporates win more tenders than SMEs is that they have a system in place to win tenders and they qualify tender opportunities before they decide to compete for them. Obviously a corporate organisation can pay for a team of people to do this, whereas an SME has more restricted resources, but with machine learning SMEs now have access to the same competitive intelligence that corporates do,” said Tony. The TenderScout tool is built with an inherent bid/no-bid qualification process which SMEs can use to gather insights about the specific tender they want to compete for. “Our tool identifies various databases while the SME owner is inputting their details and qualifies their offering against what we know. We have insights into what government buyers are already procuring and we overlay the SME’s data with this information. A report is then generated that gives the SME an accurate idea of their chances of winning the tender,” Tony explained. A simple example may be that a tender has been awarded to another incumbent three times in a row, which is a strong signal that the incumbent has an established relationship with the buyer and is delivering a cost-effective and efficient service. In all likelihood, this incumbent would win the tender again and an SME that seeks to compete for the same tender without being aware of this is wasting their time. The TenderScout tool provides eight insights, courtesy of its machine learning capabilities, that SMEs can use to optimise their own tender proposals. TenderScout offers further support to SMEs who want to compete for tenders but the key differentiator between SMEs who win, and SMEs who lose, government contracts is their ability to incorporate the insights gathered by machine learning into their B2G strategy. “We regularly see increased win rates of 50 per cent and more by our customers in Ireland, Britain and the USA. Even building a spreadsheet and keeping track of tender information that way will help a SME increase their win rate, but TenderScout makes it far simpler and demystifies public procurement for SMEs,” concluded Tony.